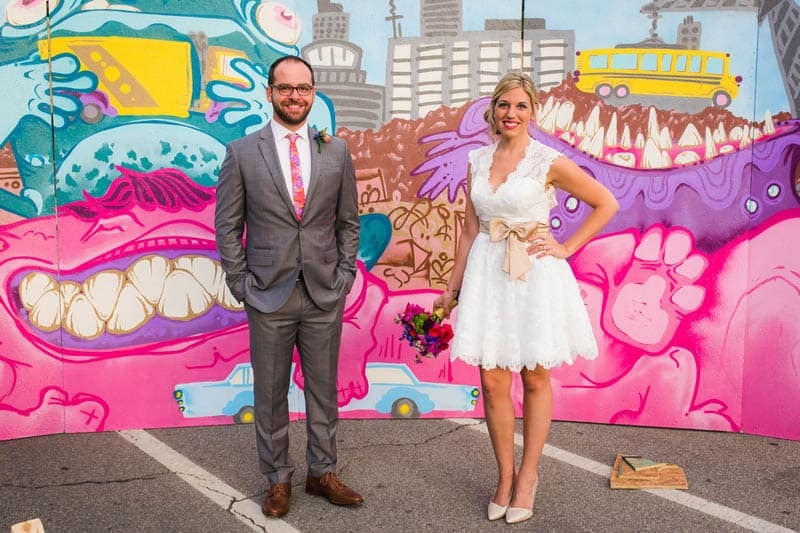 Jessica and Corey really wanted their wedding to be small and relaxed, while maintaining the celebratory sparkle you’d expect on a couple’s big day complete with lots of vibrant color. “We decided to remove all formalities beyond the “I do’s” and reserve our night for mingling with people we love. We had a very specific vision in mind for the look and feel of our wedding, so almost everything was either custom-made by a vendor or DIY’d by us.” Jessica began. “Our invitations were designed by a friend, whilst Cory created our website (it helps that that’s what he does for a living). Together we designed our photo booth backdrop, menu cards, and signage, and we spray painted old wine corks, mason jars, and picture frames to be used throughout the venue. My dress was handmade and Cory’s tie was designed to match our invitations, my mom and I made the floral arrangements, bouquets, and boutonnieres under the guidance of a local floral shop.” She added.